Announcing the Phoenix Wrap Crochet-a-Long! I’m so excited to kick off the Phoenix Wrap Crochet-a-Long with Lion Brand and Sue Rock Originals Everyone, Inc. This is a free crochet shawl pattern available in three parts that is suitable for donation to survivors of domestic violence. It’s your project, so you can also keep your version, gift it, or sell it. This post contains affiliate links. I may receive compensation (at no added cost to you) if you make a purchase using these links. This post is part of a sponsored series with Lion Brand. All opinions and thoughts are my own. More information about Sue Rock Originals Everyone, Inc.
How to enter the end-of-CAL giveaway to win great prizes! About Sue Rock Originals Everyone, Inc.
Sue Rock Originals Everyone, Inc.is a non-profit organization here in New York City. They transform new and upcycled textiles into new, handmade clothing and accessories for survivors of domestic violence. In addition, they provide crochet, knitting, and sewing classes for children, teens, and domestic violence survivors. I had the pleasure of interviewing the founder, Sue Rock (and I’ll be sharing that interview soon). I also heard her speak earlier this year and was so inspired by her mission of helping domestic violence survivors rebuild their lives and their wardrobes. When I was designing this wrap, I knew I would have to name it after the phoenix, the mythical bird that is reborn from the ashes, because domestic violence survivors also have to remake their lives after leaving for safety. I wanted to design a shawl that could be worn in different ways and all year round. I chose Lion Brand Jeans because it’s super soft, easy to care for in the washing machine, and because of its versatile, denim look. You can make your Phoenix Shawl for yourself, to gift, to donate to Sue Rock Originals Everyone, Inc. or locally, or to sell. The Phoenix Wrap is a textured and cozy rectangular shawl in 3 colors of Lion Brand Jeans. The pattern is easy enough enough for a dedicated beginner, but versatile enough to keep a more advanced crocheter interested. The Phoenix Wrap will be released in 3 parts to give you time to work on each section. Add the Phoenix Wrap to your Ravelry queue or projects. Join in by crocheting the shawl. You can make your version to donate to Sue Rock Originals Everyone, Inc.or a local charity, to gift, to sell, or to keep. Share your progress on social media. Tag your project with #undergroundcrafter and #lionbrand. (If you plan to donate your version, tag #suerockoriginals, too!) You can also tag me as @UndergroundCrafter on Facebook, MarieInNYC on Ravelry, or @ucrafter on Instagram or Twitter. If you’d like to chat with other crocheters, join the Underground Crafters Facebook group or visit this thread in the Underground Crafter Ravelry group. Share your completed project pictures at the end of this post by 11:59 p.m. Eastern on August 31, 2018 for your chance to win great prizes. See below for more details about prizes and how to enter the giveaway. At the end of the CAL, you’ll have a beautiful shawl to donate, gift, sell, or keep. This post will be updated throughout the CAL as these different parts go live. August 31: Share your completed project pictures at the end of this post by 11:59 p.m. Eastern for your chance to win an end-of-CAL giveaway prize. Update! Now that the final part of the CAL has been shared, here is the big reveal. You can see just some of the ways you can wear your Phoenix Wrap in this picture. 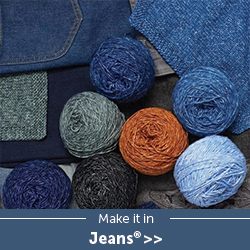 Lion Brand Jeans – 2 skeins in each of 3 colors, or approximately 492 yd (450 m) in each of 3 colors in any medium weight yarn. For my version, I used 150 Vintage, 108 Brand New, and 153 Stovepipe. You can use any 3 colors of Jeans or Jeans Colors to get a look that you’ll love. Optional, but helpful: Stitch markers. Once you have your yarn, crochet a gauge swatch using the pattern below. If your swatch is smaller than 4” (10 cm) across, try using a larger hook. If it is larger than 4” (10 cm) across, try using a larger hook. Exact gauge isn’t critical for this pattern, but having a different gauge may mean that you’ll need more (or less) yarn to make the wrap. 17 hdcBL = 4” (10 cm). Exact gauge is not critical for this pattern. Row 2: Turn, ch 1, hdcBL in first st and in each st across. Rep Row 2 until this piece measures about 4” (10 cm) long. C’mon, admit it. Crochet-a-longs are way more fun with prizes, aren’t they? To enter the end-of-CAL giveaway for your chance to win one of four prizes from Lion Brand, ArtFunctionalWood, Creativity Happens, and Lazadas, share a picture of your completed Phoenix Wrap projects by 11:59 p.m. Eastern on Friday, August 31, 2018. One lucky winner will get 6 skeins of Lion Brand Jeans yarn in the winner’s choice of color(s). That’s enough to make another Phoenix Wrap, or a different project of your choice. If you’re new to Jeans, find out more in this video. Another lucky winner will get this hand turned crochet hook made by ArtFunctionalWood. This stunning hook uses a combination of ebony and pink ivory wood from Africa and spalted maple from the U.S.
A third winner will receive a vibrant, ceramic yarn bowl in the winner’s choice of color from Creativity Happens. It’s beautiful and functional! Check out Barbara’s Instagram for more of her yarn bowls and inspiration. And, our fourth winner will get a long (70”) set of blocking wires by Lazadas. These are the blocking wires I use for my own shawls. You can read my review and see them in action here. Edited to add: Congratulations to our winners! Check out their projects, shown clockwise from the top left: Irma53 on Ravelry, Jo’s Crafty Hook, tinjeannie on Ravelry, and bfrg on Ravelry. I love how each version looks so different because of the color choices.